Note: Weighted by household and not individual. Burton, P. and Phipps, S. 2010. Families, time and well-being in Canada, Luxembourg Income Study Working Paper Series, No. 537, pg. 30, accessed at http://www.lisproject.org/publications/liswps/537.pdf on January 15, 2012. 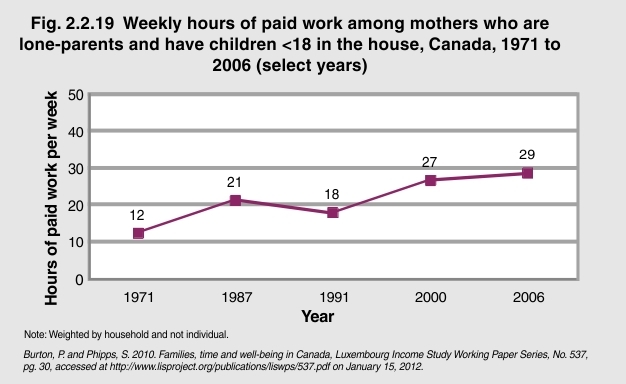 In 1971, a lone-parent mother worked on average 12 hours per week to support her family. By 1987, that number had increased to 21 hours per week. At the start of the new millennium, lone-parent mothers were working 27 hours per week and most recent estimates suggest that number is continuing to climb, having reached 29 hours per week in 2006. In spite of this increase, in 2006, real disposable incomes for lone-parent mothers were low. Earnings for lone-parent mothers have also increased. In 1971, lone-parent mothers on average had disposable incomes of $9,825. In 1991, this had increased to $15,120 and, by 2006, the average amount of disposable income for lone-parent mothers was $22,874. Although in recent years mothers who are lone-parents are earning more employment income, they are also spending more time in the workplace, leaving less time for them to be at home with their children. Further, in spite of the increase in the amount of time they are working, their incomes continue to be low.